Once named the rice capital of the New World because of the many plantations, Charleston has many lavish plantations like Middleton Place, which spans on 65 acres being the oldest landscaped garden or Magnolia Plantation with gardens dating back to the 17 century and known by the beautiful Spanish Moss. The only tea plantation in the nation, Charleston Tea Plantation can be also found here. The city market is a must see because is centered around the historic feel of an old open air market where individual vendors sell their products. The French Quarter is located in the original city limits being the home of hundreds of works of art. If you are more of a bar and restaurant person, you must visit King Street. 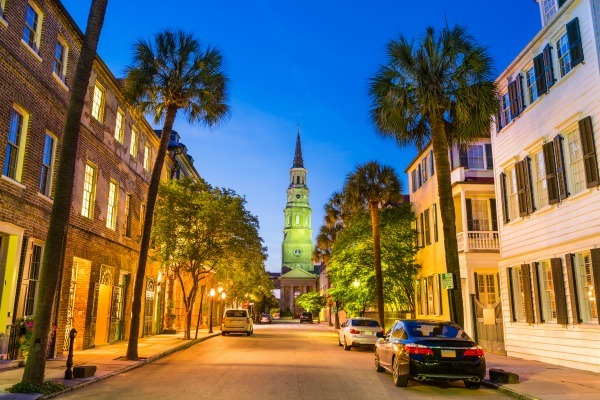 Everything you need in Charleston can be found on this street. You can find from fancy restaurants to high end shops with exquisite, one of a kind high end goods. Charleston’s unique cuisine is also representative for the south. You have to taste the famous Shrimp and Grits. For those who like aircraft’s, Charleston has an impressive Naval and Maritime museum that’s home to USS Yorktown aircraft carrier, a destroyer, submarine and several aircrafts. You can’t enjoy the beach in the city of Charleston because it’s a harbor town but this is not a problem when other 3 beaches are close by: the Isle of Palm, not crowded and full of upscale beach condos, Sullivan’s Island with beautiful rental homes and a flat sand beach and Folly Beach popular with college students and vacationers. The close by Kiawah Island is the home of the famous Kiawah Island Golf Resort, home of the top golf courses in the world. The hardest part in visiting such a beautiful place is to decide where to stay. The multitude of hotels makes it a difficult job to decide, but you can’t go wrong with any of them because you will spend more of your time visiting the city.